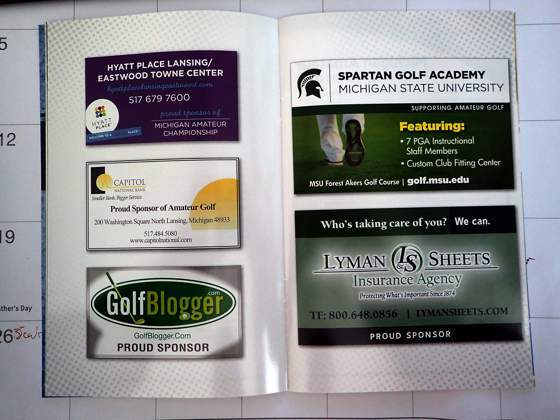 GolfBlogger is one of the official sponsors of the 105th Michigan Amateur Championship. The 105th Michigan Amateur Championship will be held June 19 – 25 at Eagle Eye Golf Club, near Lansing, Michigan. Eagle Eye is the first non-resort public course to hold the Championship. Belvedere has hosted the Michigan Amateur 40 times. Country Club of Jackson and Saginaw Country Club have hosted seven times each. The first public course was Michaywe, a resort in Gaylord. Boyne Highlands’ Heather has also hosted. Originally conducted by the Michigan State Golf League, the Michigan Amateur has been the flagship tournament of the Golf Association of Michigan since 1946 (although the GAM was called the Detroit District Golf Association until 1961). The GAM has some 60,000 member golfers and 479 member golf clubs.